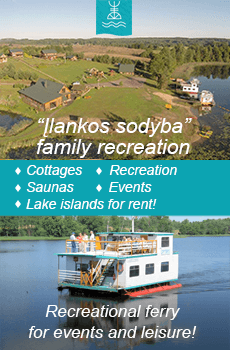 Homestead in Moletai district "Antalakaja"
Staying for 2 nights, 50% discount for the second night is applied. 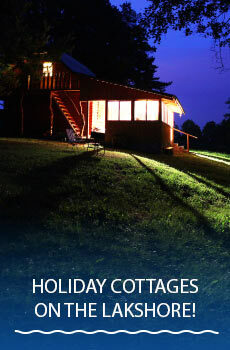 Perfect family holiday cottages with amenities for your perfect recreation in nature near the lake! Holiday cottages, banquet-conference halls, bathhouses, hot tub (Japanese bath), fishing and many other entertainments in summer and witner! GPS coordinates: 55.22555, 25.62077 (Latitude, longitude). 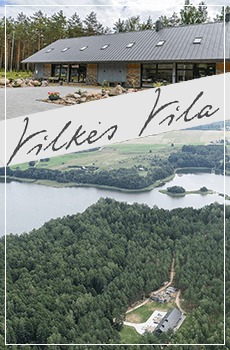 The residence is in Labanoras regional park, Molėtai district, on the bank of the Stirne rivulet, 500 m away from the lake Baltieji Lakajai. For accommodating families or small groups of 18 or 8 people, a house with three beds, two five beds houses and eight beds house with all conveniences are allotted. The houses are provided with fireplaces, TV sets, fridges, the floor heated by electricity. The project is realized so that the residents of separate houses did not interfere with each other. A lighted car parking is installed. Camping is available all year round. There is a twenty-five seats banquet hall with sauna and a lodging on the first floor. If reserved in advance, a festive table is laid. 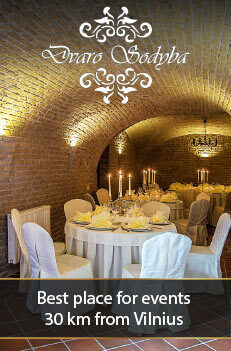 A banquet hall with a fireplace and TV, kitchenette with dishes, toilet, shower, sauna. On the second floor - 5 bedrooms with single beds: 3 triple rooms, 1 quadruple room and 1 room for 5 persons. The house is particularly suitable for seminars, birthdays, anniversaries, Christmas or New Year parties. The house is equipped with a separate pergola and grill, outdoor terrace. You can swim in a nearby water pond. Excellent cuisine, professional service and reasonable prices - guaranteed. 8-bed holiday cottage with all the amenities. The first floor of the house has a sitting room with a fireplace and TV, kitchenette, toilet and shower. On the second floor there are 3 bedrooms: 2 triple rooms and 1 double room. The cottage is particularly suitable for small companies up to 8 persons. The floor of the first floor is heated. The house has a separate pergola, grill and outdoor terrace. Holiday cottage for up to 5 guests with all amenities. The first floor of the house has a sitting room with a fireplace, kitchen, toilet, shower, double sofa bed. The second floor has a bedroom with 1 double and 1 single bed. Especially suitable for family. The holiday cottage has a separate pergola, grill, terrace, balcony. Cozy triple holiday cottage with all the amenities. The first floor of the cottage has a sitting room, toilet and shower. The second floor has a bedroom with one double and one single bed. The cottage has a kitchenette, refrigerator, dishes, TV., heated floor. The holiday cottage is particularly suitable for couples. It has a pergola, grill, terrace, balcony. 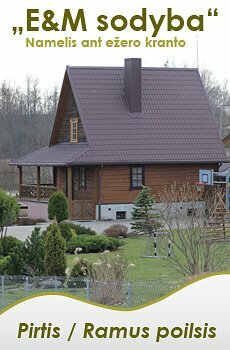 A large playground - park for children in the homestead with swings, trampoline, sandbox. Sports fields for both children and their parents: mini football field, volleyball field, basketball board. There is a hothouse in the homestead where you can dry mushrooms, berries and fish. In mushroom picking season you can dry the mushrooms, that you pick by yourself. In fishing season (all-year-round) you can dry your cought fish. It is free of charge for the holidaymakers of our homestead. Discounts. Discounts are applied hiring the whole homestead and staying for more than 2 nights.